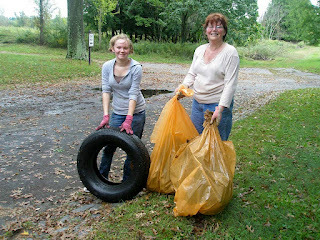 Friends of Princeton Nursery Lands will host its annual National Public Lands Day work session in the Mapleton Preserve on Saturday, September 29, 2012, from 2 to 4 pm. National Public Lands Day is the nation's largest hands-on volunteer effort to improve and enhance the public lands Americans enjoy. Friends of Princeton Nursery Lands invites the public to play a part and contribute to the restoration of the Mapleton Preserve, the former home of Princeton Nurseries and a significant historical site in Central New Jersey. Volunteers can spend an hour or two helping to clear trails by removing brush, vines and invasive saplings and shrubs. Or they can join the weed, water and mulch tream, or collect litter with the trash crew. Some tools will be available, but participants are encouraged to bring their own loppers, saws, clippers and rakes. Work gloves, long pants, long-sleeved shirts and hats are also recommended. The entrance to the Mapleton Preserve is at 145 Mapleton Road in Kingston. (If approaching the preserve from Princeton Landing, the entrance is on the right, marked by a sign for the D&R Canal State Park Headquarters.) For more information, visit the FPNL website or call 609-683-0483. This is such an important day! Public lands belong to all of us, and are there for us to enjoy--but they are our responsibility, too, in perpetual need of our care and vigilance. Please join us in the Mapleton Preserve on the 29th!